Development on Free Company steadily continues here in the shed. I’ve had to venture out into the cruel, uncaring world a bit more than usual recently to earn enough money for those precious wheelbarrows full of coal that keep the code furnaces at full power. It slows the development rate for a few weeks on the one hand but on the other its good to eat food. That aside, I’m currently focused on creating the primitive skeleton that will help join the 3D tactical battles together into a compelling campaign style narrative in your minds for the initial paid alpha version. A lot of the work here will be reused when I get to making the ‘proper’ map driven campaign later on so it’s not a total waste long term and hopefully it’ll make the alpha much more fun to play for a series of battles and thereby generate a whole raft more testing feedback if any lovely person does choose to take the plunge and give it a try for a small fee. So what’s going in this overgame skeleton for the alpha? 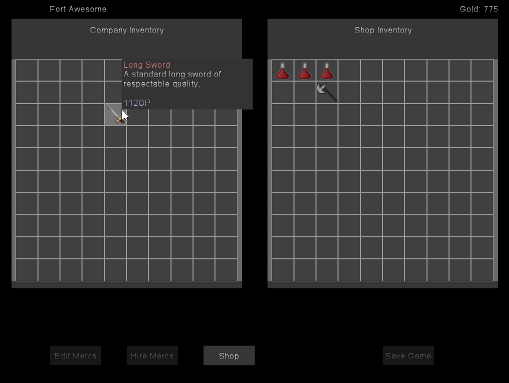 First up I’ve been working on a shop where you can restock your mercenaries consumables and outfit them with new weapons and other equipment. Secondly, there’s going to be a menu to recruit fresh-faced wannabe mercs to build up your fighting force and tackle more contracts/tactical battles. Thirdly there is going to be some basic facilities for equipping and editing those new recruits so you can roughly shape them into the kind of fighting force of your dreams. Then finally there is going to be the contracts board where you can pick contracts to accept, dispatch a squads of mercs to take care of accepted contracts and start the tactical battle when they arrive. The campaign screen will also have some other handy functionality, like the ability to save your game, which’ll also mean that the ‘load’ option on the main menu finally does something! Hooray! If you can think of any other essential ‘overgame’ screens/menus/options that I should absolutely cram in before the alpha version then do let me know, perhaps in the comments below even. I’ve recently ‘rebranded’ my twitter feed to the more personable (and more related to this fledging gamedev shop) @danintheshed. Existing followers should have transferred over with no problem, but if you are new and interested in Free Company and whatever else I might put out then that’s as good a place as any to get updates. This entry was posted on Wednesday, June 1st, 2011 at 17:20	and posted in Free Company, Game design, Programming. You can follow any responses to this entry through the RSS 2.0 feed.